Is It Wrong to Try to Pick Up Girls in a Dungeon? (henceforth referred to by its Japanese abbreviation DanMachi) is one of my favourite light novel series, so when a spin-off series was licensed in the form of Is It Wrong to Try to Pick Up Girls in a Dungeon? On the Side: Sword Oratoria (henceforth known as Sword Oratoria) I was excited. I love this universe and the chance to experience it from the perspective of different characters was a welcome one. However, has this first volume managed to live up to my love of the main series? Sword Oratoria focuses on the famous adventurer Aiz Wallenstein as the main character, someone that readers of the main DanMachi series will be familiar with. Aiz belongs to one of the most powerful Familia in the city, Loki Familia. This first volume takes place during the same time frame as the first DanMachi volume and starts off with Loki Familia’s expedition down to the deepest depths of the dungeon. The dungeon is where all adventurers go to battle against monsters to earn a living. This is the journey that eventually led to Aiz saving Bell from a Minotaur, which had gotten away from her while she was hunting a pack of them. Her encounter with Bell is one that we know changed his life significantly, but seeing it from Aiz’s perspective is also quite interesting. The furthest we’ve been in the dungeon with Bell thus far (as of Volume 6) is down to around the 20th floor, so being able to go much further in with the Loki Familia group is a welcome change of pace. Author Fujino Omori openly admits that Aiz is too powerful a character to frequently use in DanMachi (she’d instantly save the day for Bell just by clicking her fingers) so giving her a series all of her own works out very well. Sword Oratoria gives Aiz the chance to take on enemies that are more suited to her level and fighting abilities. It also gives Omori the chance to write more about Loki Familia and spend some time with the characters we’ve come to know through DanMachi itself (like Loki and Bete). Being the same author as the main series, Omori has the ability to freely overlap the Sword Oratoria and DanMachi plotlines. Thankfully the overlapping is kept to a minimum for this volume, which I feel is important because it allows a new story to develop. Aiz and Bell interact a lot more going forward in DanMachi, so one of my main concerns for Sword Oratoria is that portraying the same scenes as DanMachi could begin to feel redundant beyond being from Aiz’s prospective. Running Sword Oratoria alongside the main series also means that nothing of importance can happen that could impact on the main storyline, at least not until it catches up with the timeline of the latest volume. I think Sword Oratoria is important to the DanMachi series as far as newcomers are concerned. While not everything is explained in as much detail as it was in the main series, stuff like Familia, levels, stats and the world are explained in enough detail that even if you’ve never watched the anime, or read the original books, you’ll still be able to slip into Sword Oratoria quite comfortably. It’s not just a good starting point, though, as veterans of the DanMachi series will find a lot to love here too. Omori has very obviously set out with the goal of exploring Aiz as a character and leaves various hints throughout the plot that Aiz wasn’t always the quiet, often emotionless girl we’ve come to know. Couple this idea with some impressive battles and we’ve matched the quality of DanMachi at its best – although I will confess that I do miss our usual dungeon exploring with Bell. 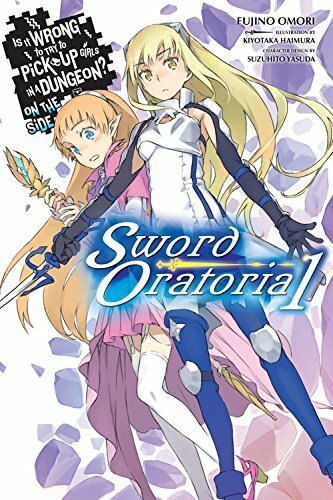 Omori has written Sword Oratoria from a third person perspective with the occasional jump to first person if Aiz has anything on her mind (which, admittedly, is rare), and his usual style of writing shines through in his detailed explanations of the world around the characters. This series has a new illustrator named Kiyotaka Haimura (he also provided illustrations for A Certain Magical Index) and the art on offer is really good. One of my favourite pieces is a two page spread dedicated to Aiz delivering the final blow to a high level monster, but the opening colour pages also depict this same battle with other members of Loki Familia and looks pretty cool in its own right. While I have some concerns about the future of Sword Oratoria and the overlap and consistency it requires with the main series, I’m equally really excited by getting to spend some real time with Aiz. I’m not sure I’ve enjoyed my time with the first volume as much as I do DanMachi itself but I’d still highly recommend it to other fans of the series and newcomers alike. This is definitely a series to keep an eye on.